Canadian international Alphonso Davies' debut for Bayern Munich came with a trophy. The 18-year-old hoisted the Telekom Cup in a sea of confetti Sunday after helping the German powerhouse to a 4-2 penalty shootout win over Borussia Moenchengladbach in the final of the four-team competition held during the Bundesliga's winter break. Canadian international Alphonso Davies' debut for Bayern Munich came with a trophy. 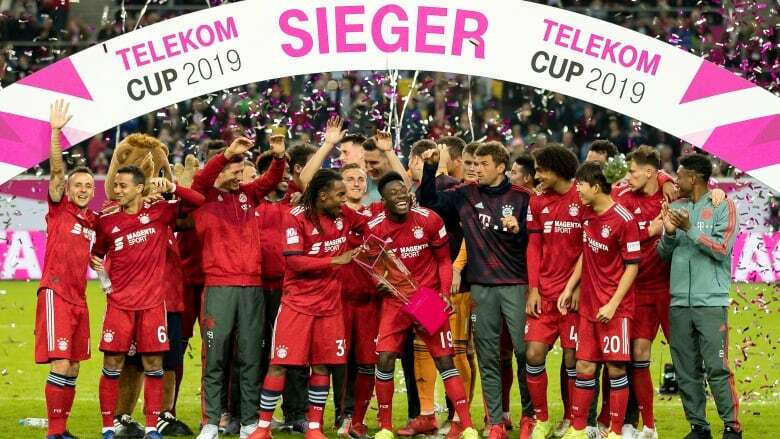 The 18-year-old hoisted the Telekom Cup in a sea of confetti Sunday after helping the German powerhouse to a 4-2 penalty shootout win over Borussia Moenchengladbach in the final of the four-team competition held during the Bundesliga's winter break. The tournament format featured a 45-minute half, followed by penalties if needed. Bayern's Mats Hummels scoring the winning penalty, slotting it into the middle of the goal. James Rodriguez, Brazil's Thiago and Leon Goretzka also scored in the shootout for Bayern. Davies started on the left side of midfield and showed some nice early touches, at one point taking a pass and flicking it past a defender. Davies went down late in the game on Andreas Poulsen's challenge but no penalty was given. Davies joined Bayern from the Vancouver Whitecaps in a MLS record-breaking $22-million US transfer deal that will see him play for the German side through 2023. The deal was consummated in July but Davies finished out the MLS season before joining Bayern in January. Bayern won the tournament without scoring a goal in regulation. Bayern beat Fortuna Duesseldorf 8-7 on penalties to the advance to the final while Borussia Moenchengladbach downed Hertha Berlin 1-0. Renato Sanches was the only Bayern starter from the semifinal to keep his place Sunday. Davies has made nine appearances for Canada with three goals and four assists. He was 15 when he made his MLS debut, becoming the second youngest player in league history — behind Freddy Adu — and the first born in the 2000s. The Bundesliga resumes this week with Bayern playing Hoffenheim on Friday.